The front suspension is very close to the book with only a few exceptions. The upper control arms are not straight-sided triangles. I bent the arms to assure plenty of clearance for the coil-over shocks. I also made the arms longer because the Miata's rear track was much wider than the axles suggested by the book. 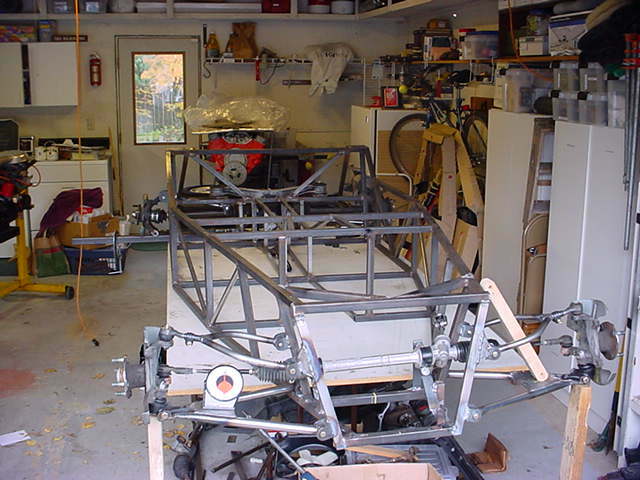 The rear lower control arm was fabricated from 0.090 wall tubing and cross-braced to be able to withstand the force required for acceleration. Adjustable bushings were made for the inside to allow a small degree of camber and tow adjustment. Here's a lousy photo, but it shows the upper control arm and lower control arm in position. There is no alignment provision on the upper arm, only the lower.